You have learnt earlier that all organisms need food, water and oxygen for survival. They need to transport all these to various parts of their body. Further, animals need to transport wastes to parts from where they can be removed. Have you wondered how all this is achieved? Do you see the heart and the blood vessels? They function to transport substances and together form the circulatory system. What happens when you get a cut on your body? Blood flows out. But what is blood? Blood is the fluid which flows in blood vessels. It transports substances like digested food from the small intestine to the other parts of the body. It carries oxygen from the lungs to the cells of the body. It also transports waste for removal from the body. How does the blood carry various substances? Blood is a liquid, which has cells of various kinds suspended in it.The fluid part of the blood is called plasma. One type of cells are the red blood cells (RBC) which contain a red pigment called haemoglobin. Haemoglobin binds with oxygen and transports it to all the parts of the body and ultimately to all the cells. It will be difficult to provide oxygen efficiently to all the cells of the body without haemoglobin. The presence of haemoglobin makes blood appear red. Boojho fell down while playing a game and his knee got injured. Blood was coming out from the cut. After some time, he noticed that bleeding had stopped and a dark red clot had plugged the cut. Boojho was puzzled about this. There are different types of blood vessels in the body. You know that during inhalation a fresh supply of oxygen fills the lungs. Oxygen has to be transported to the rest of the body. Also, the blood picks up the waste materials including carbon dioxide from the cells. This blood has to go back to the heart for transport to the lungs for removal of carbon dioxide . So, two types of blood vessels, arteries and veins are present in the body. Arteries carry oxygen-rich blood from the heart to all parts of the body. Since the blood flow is rapid and at a high pressure, the arteries have thick elastic walls.Let us perform an activity to study the flow of blood through arteries. Place the middle and index finger of your right hand on the inner side of your left wrist . Can you feel some throbbing movements? Why do you think there is throbbing? This throbbing is called the pulse and it is due to the blood flowing in the arteries. Count the number of pulse beats in one minute. How many pulse beats could you count? The number of beats per minute is called the pulse rate. A resting person, usually has a pulse rate between 72 and 80 beats per minute. Find other places in your body where you can feel the pulse.Record your own pulse beats per minute and those of your classmates.Compare the values you obtained and insert them in Table. Do you see the arteries divide into smaller vessels. On reaching the tissues, they divide further into extremely thin tubes called capillaries. The capillaries join up to form veins which empty into the heart. Imagine a pump working for years without stopping! Absolutely impossible. Yet our heart works like a pump non-stop. Let us now learn about the heart. 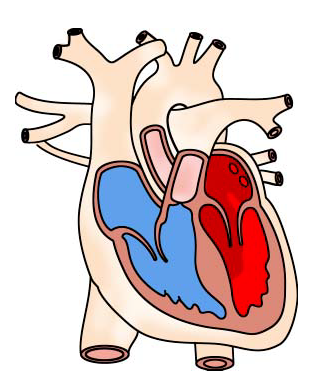 The heart is located in the chest cavity with its lower tip slightly tilted towards the left . Hold your fingers inwards on your palm. That makes your fist. Your heart is roughly the size of your fist. What will happen if the blood rich in oxygen and the blood rich in carbon dioxide mix with each other? To avoid this from happening, the heart has four chambers. The two upper chambers are called the atria (singular: atrium) and the two lower chambers are called the ventricles. The partition between the chambers helps to avoid mixing up of blood rich in oxygen with the blood rich in carbon dioxide. To understand the functioning of the circulatory system, start from the right side of the heart in and follow the arrows. These arrows show the direction of the blood flow from the heart to the lungs and back to the heart from where it is pumped to the rest of the body. The walls of the chambers of the heart are made up of muscles. These muscles contract and relax rhythmically. This rhythmic contraction followed by its relaxation constitute a heartbeat. Remember that heartbeats continue every moment of our life. If you place your hand on the left side of your chest, you can feel your heartbeat. 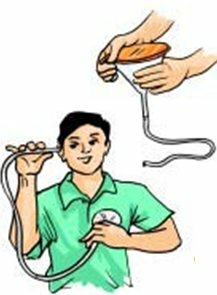 The doctor feels your heartbeats with the help of an instrument called a stethoscope.A doctor uses the stethoscope as a device to amplify the sound of the heart. It consists of a chest piece that carries a sensitive diaphragm, two ear pieces and a tube joining the parts. Doctors can get clues about the condition of your heart by listening through a stethoscope. Let us construct a model of a stethoscope with the materials that are available around us. Take a small funnel of 6 to 7 cm in diameter. Fix a rubber tube (50 cm long) tightly on the stem of the funnel. Stretch a rubber sheet (or a balloon) on the mouth of the funnel and fix it tightly with a rubber band. Put the open end of the tube on one of your ears. Place the mouth of the funnel on your chest near the heart. Now try to listen carefully. Do you hear a regular thumping sound ? The sound is that of heart beats. How many times did your heart beat in a minute ? Count again after running for 4-5 minutes. Compare your observations. Record your own pulse rate and heart beat and that of your friends while resting and after running and record in Table 11.2. Do you find any relationship between your heart beat and pulse rate? Each heart beat generates one pulse in the arteries and the pulse rate per minute indicates the rate of heart beat. Boojho wonders if sponges and hydra also have blood? Animals such as sponges and Hydra do not posses any circulatory system. The water in which they live brings food and oxygen as it enters their bodies. The water carries away waste materials and carbon dioxide as it moves out. Thus, these animals do not need a circulatory fluid like the blood. Let us now learn about the removal of waste other than carbon dioxide. When our cells perform their functions, certain waste products are released. These are toxic and hence need to be removed from the body. The process of removal of wastes produced in the cells of the living organisms is called excretion. The parts involved in excretion forms the excretory system. Recall how carbon dioxide is removed as waste from the body through the lungs during exhalation. Also recall that the undigested food is removed during egestion. Let us now find out how the other waste materials are removed from the body. You may wonder where these unwanted materials come from! The waste which is present in the blood has to be removed from the body. How can this be done? A mechanism to filter the blood is required. This is done by the blood capillaries in the kidneys. When the blood reaches the two kidneys, it contains both useful and harmful substances. The useful substances are absorbed back into the blood. The wastes dissolved in water are removed as urine. 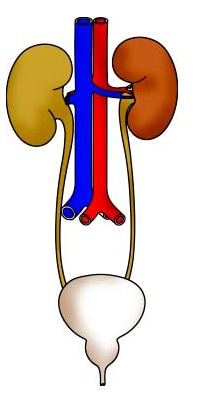 From the kidneys, the urine goes into the urinary bladder through tube-like ureters. It is stored in the bladder and is passed out through the urinary opening at the end of a muscular tube called urethra . The kindeys, ureters, bladder and urethra form the excretory system. An adult human being normally passes about 1- 1.8 L of urine in 24 hours. The urine consists of 95% water,2.5% urea and 2.5% other waste products. We have all experienced that we sweat on a hot summer day. The sweat contains water and salts. Boojho has seen that sometimes in summer, white patches are formed on our clothes, especially in areas like underarms. These marks are left by salts present in the sweat.Does sweat serve any other function? We know that the water kept in an earthen pot (matka) is cooler. This is because the water evaporates from the pores of the pot, which causes cooling.Similarly, when we sweat, it helps to cool our body. In most animals the blood that circulates in the body distributes food and oxygen to different cells of the body. It also carries waste products to different parts of the body for excretion. Circulatory system consists of the heart and blood vessels. In humans, blood flows through arteries and veins and the heart acts as a pumping organ. Blood consists of plasma, RBC, WBC and platelets. Blood is red due to the presence of a red pigment, haemoglobin. The human heart beats about 70- 80 times per minute in an adult person. This is called heart rate. Arteries carry blood from the heart to all parts of the body. Veins carry blood from all parts of the body back to the heart. Removal of waste products from the body is called excretion. Excretory system of humans consists of two kidneys, two ureters, a urinary bladder, and urethra. Salts and urea are removed along with water as sweat. Fish excrete waste substances such as ammonia which directly dissolve in water.